Prince Shōtoku is literally on the (old) money. Every Japanese child can supply details regarding this personage’s legendary activities. Prince Shōtoku (聖徳太子) was a semi-legendary figure who lived through the late fifth and early sixth century (574-622). In 593, the Empress Seiko, his aunt, was chosen to become ruler in order to avoid a power struggle. She appointed Shōtoku as Regent and, during his period of influence, he helped achieve a centralized government. He is regarded as truly a father of Japan, introducing an early Constitution that emphasized the morals and values expected of officials and subjects of the country. He was perhaps most influential in introducing Buddhism to Japan. His legendary status is also due to the many stories of his unbelievable intellectual powers. The earliest picture of Mount Fuji dates to 1069. 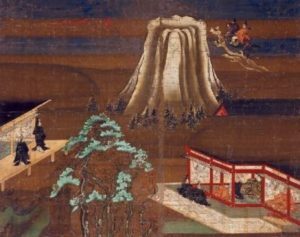 It features Prince Shōtoku flying over the mountain on a black horse accompanied by a servant. While it is not a very accurate depiction of Mount Fuji, it was clearly intended to suggest the Prince’s super-human abilities. The mountain does not tower over a man with magical abilities. This story parallels that of the Buddha, who is credited with climbing a snow-peaked mountain in one night. The Prince flying over a not very accurate representation of Mount Fuji on his black horse, accompanied by a servant. Although Mount Fuji is not an obstacle to Prince Shōtoku, as it was associated with people of incredible ability, Mount Fuji also improved its status because of such tales. 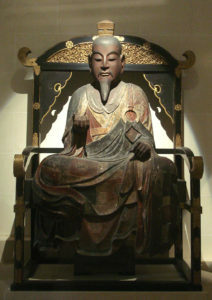 Another important example of this kind of legend is the one connected to En no Gyōja (役行者) who died at the beginning of the eighth century (around 700). En no Gyōja was a mystical mountain man who engaged in astonishing spiritual and physical training. He is regarded as the founder of Shugendō (修験道), a mix of religions based on direct experience of reality, centered on training in the mountains. Although En no Gyōja’s magical powers continued to be highly regarded, he was treated with fear and suspicion and was finally banished to Izu Island in 699 AD. He was not happy to be controlled, however, and made regular night flights to Mount Fuji! While you may not believe all these stories, you get the idea that, through narrative, the mountain was becoming associated with legendary people and increasing its prestige and fame as a result. Indeed, Japan’s oldest story, The Tale of the Bamboo Cutter, features Mount Fuji in its finale as the closest place to heaven on earth, deeply associated with immortality.